Press and hold the (interval) button for one second. 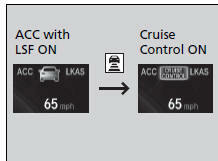 Cruise Mode Selected appears on the driver information interface for two seconds, and then the mode switches to Cruise. To switch back to ACC with LSF, press and hold the button again for one second. ACC Mode Selected appears on the driver information interface for two seconds. Desired speed in a range above roughly 25 mph (40 km/h) ~. Always be aware which mode you are in. When you are driving in Cruise mode, the system will not assist you to maintain a following interval from a vehicle ahead of you.